[172 Pages Report] The database automation market size is expected to grow from USD 407.0 Million in 2017 to USD 1,714.0 Million by 2023, at a Compound Annual Growth Rate (CAGR) of 28.3% during the forecast period. The base year considered for this study is 2017, and the forecast period considered is between 2018 and 2023. 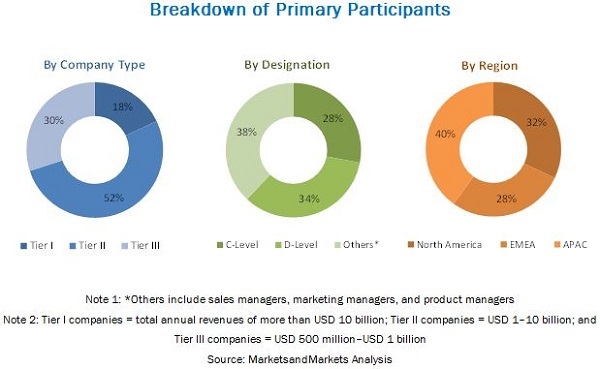 Continuous growth in the volume of data across verticals, increase in the need for database automation solutions, rise in the demand for automating repetitive database management processes, and surge in the demand for automating business processes to reduce cost and time are the major driving factors for the market. The objective of the study is to define, describe, and forecast the global database automation market on the basis of components (solutions and services), solutions (database design and configuration automation, database patch and release automation, database test automation, and application release automation), services (professional and managed), applications (provisioning, backup, and security and compliance), deployment modes (cloud and on-premises), enterprise size (large enterprises and Small and Medium-sized Enterprises [SMEs]), verticals (manufacturing; healthcare; Banking, Financial Services, and Insurance [BFSI]; research and academia; media and entertainment; retail and eCommerce; government and defense; telecom and Information Technology [IT]; and others [transporatation, and oil and gas]), and regions. The report also aims at providing detailed information about the major factors (drivers, restraints, opportunities, and challenges) influencing the growth of the market. The major vendors in the global database automation market are Microsoft (US), IBM (US), Oracle (US), CA Technologies (US), BMC Software (US), Micro Focus (UK), AWS (US), Datavail (US), Percona (US), DBmaestro (US), HelpSystems (US), Datical (US), Redgate (UK), WhereScape (New Zealand), Severalnines (Sweden), Quest Software (US), IDERA (US), SAP (Germany), Chef (US), Redis Labs (US), NuoDB (US), TestingWhiz (US), Puppet (US), Clustrix (US), and MemSQL (US). The global database automation market is expected to grow from USD 493.4 Million in 2018 to USD 1,714.0 Million by 2023, at a Compound Annual Growth Rate (CAGR) of 28.3% during the forecast period. The proliferation of cloud-based applications and services, and the rising partnerships and acquisitions in the database management space are some of the major driving factors for the market. Furthermore, increasing demand for intelligent business processes and growing innovation across verticals are expected to provide growth opportunities for the market. In the database automation market by component, the solutions segment is expected to account for the larger market size during the forecast period. The database design and configuration automation segment is expected to grow at the highest CAGR during the forecast period. The database design and configuration automation segment helps enterprises automate the process of conceptual, logical, and physical design of databases, which is difficult and error-prone if done manually. Various verticals, such as Banking, Financial Services, and Insurance (BFSI); healthcare; and retail and eCommerce, are deploying database automation solutions to automate the database management processes. This is done for being less concerned about the state of databases, and to focus on formulating various business strategies and make business-critical decisions. In the application segment, the provisioning segment is expected to account for the largest market size during the forecast period. The provisioning segment helps enterprises prevent database downtimes and offers high availability of systems. In the deployment mode segment, the cloud segment is expected to account for the larger market size and projected to grow at a higher CAGR during the forecast period. Cloud-based solutions offer wide and agile solutions to end-users in the database automation market. In the enterprise size segment, the large enterprises segment is expected to account for the larger market size and projected to grow at a higher CAGR during the forecast period. The large enterprises segment is adopting database automation solutions, owing to the generation of large volumes of data. Among verticals, the BFSI vertical is expected to be the highest contributor, and the retail and eCommerce vertical is projected to grow at the highest CAGR during the forecast period. Both the verticals are deploying database automation solutions to automate the manual and repetitive database management processes, as both verticals are generating a huge amount of data on a daily basis. The other verticals, such as manufacturing, healthcare, telecom and IT, government and defense, and media and entertainment, are contributing significantly to the growth of the database automation market due to an increased need for automated database management solutions, reduced infrastructure costs, accelerated time to market, and improved business processing time. 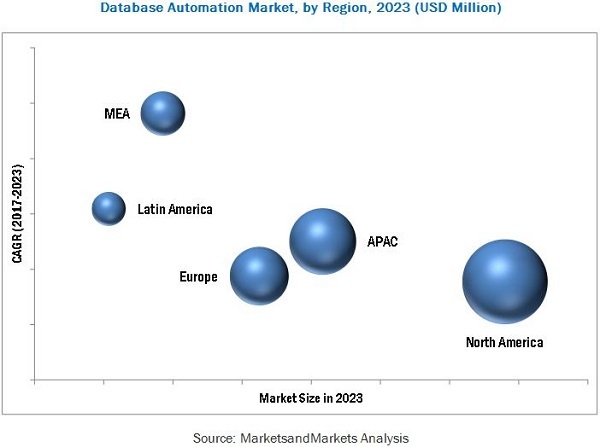 The global database automation market has also been segmented on the basis of major geographic regions: North America, Europe, Asia Pacific (APAC), Middle East and Africa (MEA), and Latin America. North America is expected to be the largest revenue-generating region, as there is a high focus on innovations in the US and Canada. These countries have the most competitive and rapidly changing market across the globe. MEA is expected to be the fastest-growing region in the market. The higher rate of infrastructure development and immense growth of data from all verticals are expected to make MEA a highly potential market for growth. Lack of standardization in database management and data security, and privacy concerns may affect the growth of the database automation market. A predefined set of rules and regulations needs to be considered while automating the database management processes. However, the lack of uniform rules and regulations at the global level may result in a slow growth rate of the market. The major vendors offering database automation solutions across the globe include Microsoft (US), IBM (US), Oracle (US), CA Technologies (US), BMC Software (US), Micro Focus (UK), AWS (US), Datavail (US), Percona (US), DBmaestro (US), HelpSystems (US), Datical (US), Redgate (UK), WhereScape (New Zealand), Severalnines (Sweden), Quest Software (US), IDERA (US), SAP (Germany), Chef (US), Redis Labs (US), NuoDB (US), TestingWhiz (US), Puppet (US), Clustrix(US), and MemSQL (US). *Details on Business Overview, Products/Services Offered, Recent Developments, SWOT Analysis, and MnM View Might Not Be Captured in Case of Unlisted Companies.